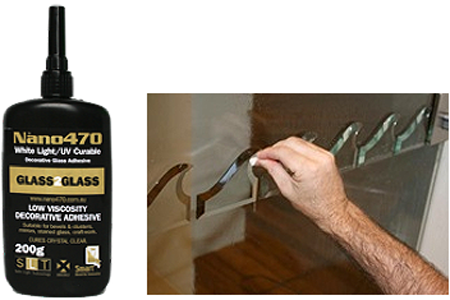 Nano470's Decorative Glass Glue is a invisible-curing adhesive for your decorative glass-to-glass needs. Perfect for applying beveled glass to glass, glass logos to glass, and glass to mirror adhesion. Cures with any fluorescent light. No UV rays. Safe to use and great for DIY projects. Distributed by Troy Systems.